Rambling Rican: Indiegogo Update! Good news! Edited: February 3, 2015 - Link to the new campaign is up! Edited: February 5, 2015 - Updated with news of more 2015 Sasuke shirts! Link to the new Indiegogo Campaign! Just wanted to give you an update on the huge IndieGogo Fundraiser I'm doing trying to raise money to fly to Japan. I also did an update on the fundraiser website but wanted to update the blog as well. As some of you know by now (as I've contacted the current backers - thank you so much! ), this project has received incredible news. Thanks to the generosity of a new contributor, the airfare to Japan will be covered! That alone saves the project $4000 and removes a HUGE amount of stress. With the biggest price tag and most difficult portion of the fundraiser now covered, I'm able to focus on reorganizing the trip to Sasuke 31!! However, there is was one outstanding problem. I cannot change the goal amount, the type of funding (it's currently fixed), nor the timeline for this project. As a result, this current fundraiser will most likely fail on February 16th. If new options become available to change that, I'll update with information as soon as possible. EDIT: IndieGogo gave me the go ahead to launch the new campaign now. The old one is now officially closed. I appreciate IndieGogo allowing for this One-time allowance given the extraordinary circumstances! 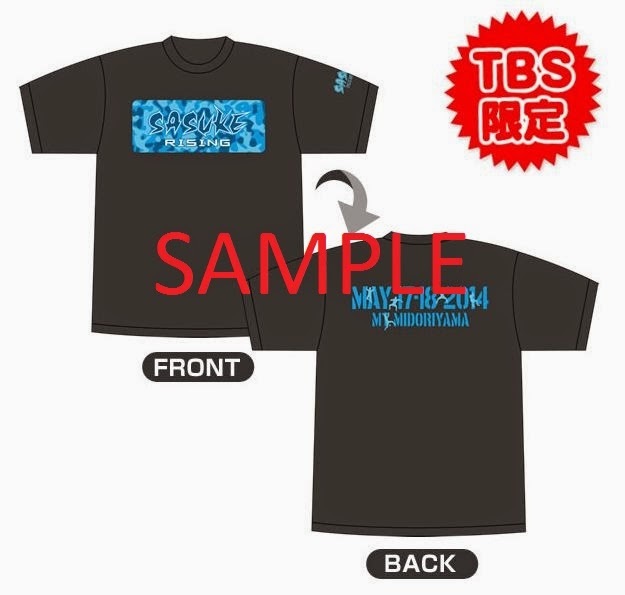 These are the 2014 shirts to show an example of the type of shirts they have done in the past. I wanted to post a quick update. I will be able to secure more T-shirts BEFORE the tournament and that makes me very happy. As such I can get them bought before I arrive and have them waiting for me when I arrive in Japan. I edited the 2014 perk and replaced it with new 2015 shirts! If you are still interested in the old one just send me a message and I can get that ordered for you. I know the 2015 ones were highly sought after and with the transition of the campaign, some of you were lost in the shuffle in being able to secure the new shirts. The old campaign is now officially closed and those who have holds on either your credit card or PayPal (from the previous campaign), they should be lifting soon. I also see that IndieGogo is addressing some of the weird bugs of the first day contributions not posting onto the campaign directly (even though I received notification from PayPal that you were charged). For those affected, you should have gotten an email from Support. Let me know if this has NOT happened and I'll take care of it. Thanks for your patience! My plans were to relaunch a much smaller IndieGogo campaign to cover the costs of food, lodging, transportation (since I will be flying out of a different airport) and perk fulfillment. That is up and running of course and thank you so much for contributing so quickly to pass the 50% mark! Thanks so much for the continued support and appreciate all the wonderful feedback everyone has been giving me. It's been very stressful recently and your words of encouragement has been lifting my spirits. I'm truly grateful. WOW that's a amazing offer. Well you know I'll re donate what I gave before.But I might do it in smaller bits so I can do some of the signed photos and T-shirts. That's really sweet! Thanks! Yeah it's a bit complicated only because the airfare is not reflected on the fundraiser in dollar amounts. Otherwise I would have been almost hitting the goal! It's saving me $4,000! I'll update when I get the 2nd fundraiser up with the lower amount. I'm happy it's not confusing people becuase I was worried I was going to alienate everyone with the multiple indiegogos.